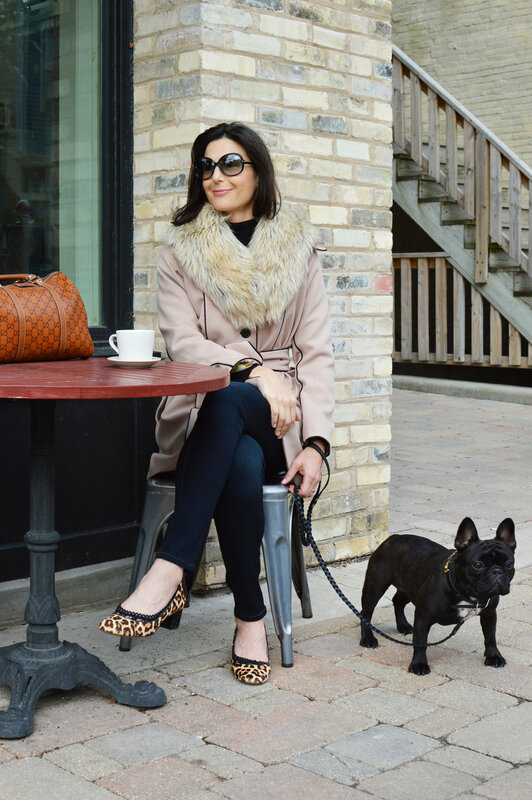 Carrie Tate wearing a custom Madalyn Joy Designs trench coat holding her sweet pup, Ruby, photographed by Kortney Manzeck in Port Washington, WI. 2017. I met Carrie in May when she came to me in search of a bespoke trench coat. I was definitely intrigued and excited about the project but also knew it would be a wonderful sartorial challenge. The prospect of working with Carrie made the project even more enticing! Now I rarely say this but I can say this with confidence about Carrie... She is THE dream client! She was such an absolute joy and pleasure to work with and everything about the design process and working together was truly enjoyable. 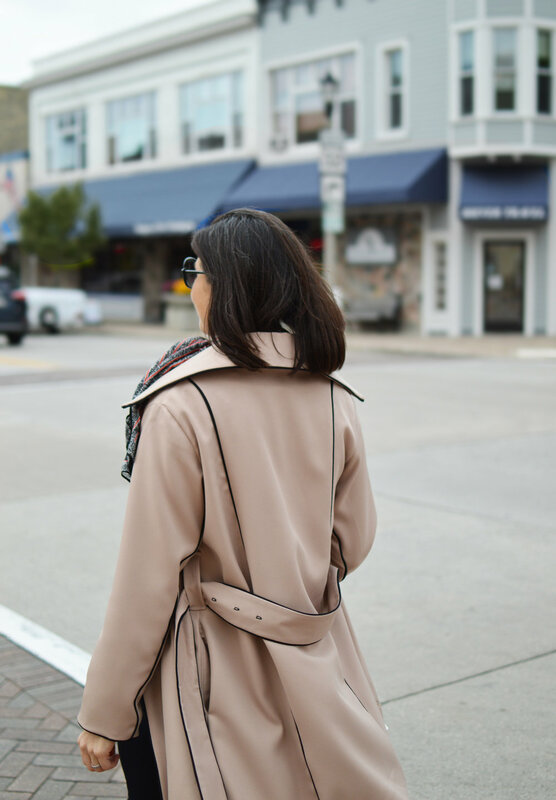 Carrie was in search of a classic camel colored trench coat with a black piping detail and fun patterned lining. We definitely took our time with the project since a jacket wouldn't really be necessary in summer so we decided to set the due date in September. I think having the luxury of time helped make the process so enjoyable. We didn't have to rush to find the perfect fabric, but instead let the perfect fabric come to us. A couple weeks ago we got together to photograph Carrie wearing her bespoke trench coat with her fabulous sidekick, Ruby. Needless to say, Ruby stole the show at times during the photo shoot with her adorable face and spunky personality! Carrie looked absolutely gorgeous and looked like the spitting image of Jackie O! She has such a classic and elegant style which allows her sophisticated nature to shine through. We wanted to show the versatility of the coat so we styled it three different ways: jet setter, Parisian chic, and glam fashionista. With different accessories and styling, it can totally transform the look of the coat! Carrie said she felt out of her element at times during the photo shoot since she isn't used to wearing high fashion looks every day. She is a stellar veterinarian and feels more comfortable wearing her daily attire of scrubs. Well, Carrie, you fooled us all! You looked like a professional jet setter just strolling down the street! Maybe that can be your new gig!? Veterinarian during the week and fabulous jet setter on the weekends!? I think it's a perfect fit. Thank you so much for letting me work on this amazing project with you, Carrie! It definitely has been one of my favorite projects to work on and I hope to work together again in the future! P. S. Huge shoutout to Kortney Manzeck for being a total boss babe photographer and for always taking the best photos! This shoot was so fun and I am so glad we were able to do it together!